As I was putting together this website for Betty, I had the priveldge to learn more about her. I already had a great deal of respect for Betty but the stories she shared and the passion she showed for all her dogs was humbling, I realised that a page such as this was in order to show case some of our thoughts of our Dear Friend Betty Taylor. Doing this without Betty knowing was tricky, trying to combine a list of contacts of her associates was quite hard and I do apologise sincerely to anyone I may have missed out on, please feel free to contribute. It has been an amazing pleasure and absolute honour to have not only met you but had the privledge to share my life with on of your gorgeous babies. Words will never convey what you gave me when you let my small bundle of fluff come home with me. The impact you have had on my life will be present always, you have been an amazing part of our lives and I owe you so much for what you gave us. I will be always grateful for the stories and life experiances you have shared with me, anyone that knows your stories couldn't be more proud of what you have accomplished. I truly hold you in high esteem and my respect for you grows continually, you have truly been in inspiration to many including myself and graced the dog world with so many successful Pomeranians. I know you will be modest as always, but I hope in some small way you can see how much you really have achieved with these amazing little dogs. I hope for many more years of your beloved company and more stories shared, no doubt my home will be graced with more Crouchent Pomeranians in the future. You not only breed beautiful dogs but extend a helping hand at any time, unlimited support and knowledge and above all compassion. Thank you Betty for all you have done for now and in the future. A few years ago my wife Anne decided we should get a Pomeranian for me to show. I know have a back problem which makes it hard for me to show our Pugs [ which we have had for over 20 years] the way I used to. After a failed encounter with a Pomeranian which grew too big, I found an advertisement for a puppy on a web site from 'Crouchent Kennels'. So I phoned this lady [Betty] & asked her what must have seemed like a thousand questions about this puppy that she had for sale. She answered all my questions & I could tell from the answers she was extremely knowledgeable & honest ! Smokey duly arrived from Betty, & what a delightful little Pom he turned out to be. Since then we have become firm friends with Betty, she has offered us so much advice about the breed. Words could never thank her enough for all this help.We are fortunate to be able to call Betty 'a real & true friend' ! We speak often by phone & through the internet to let her know how the Poms are doing or sometimes just for a chat. Since Smokey came to us [his full name is Ch Crouchent Smokey Snow] Betty has entrusted us with 2 white Poms to campaign for her. We both hope that showing these 2 will help Betty`s dream come true in producing a super line of White Pomeranians. Not only is Betty a true friend, she is honest & a pleasure to know. Having never had the privilege in meeting you personally, although through our conversations via emails, I can say that you are a wonderful person and very passionate about your Pomeranians! A few years back when I started taking an interest in Pomeranians, and was inquiring around for my first pom, you were one of two breeders who took the time to message me back. Being a stranger and not knowing my intentions, you spent your time in helping and advising me and sharing your valuable knowledge and experience to me about the breed. 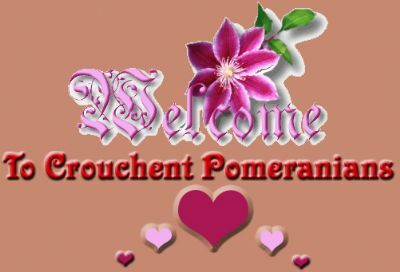 During the times I have attended shows I have always been impressed by the quality of your Pomeranians! Many of them, if not all of them are doing very well at shows even to date, which is a huge tribute to your passion, breeding practices and keen eye for quality. You certainly are a huge asset to the breed and to top it off a lovely person to talk and deal with. I hope that one day I too will share my home with one of your Pomeranians and I look forward to showing them with success in the near future! In the mean time I will always enjoy talking to you via email, and look forward to the day I meet you personally! Although I have not yet met you Betty I feel that I have known you for ages. I hope one day that we can sit down and have a coffee and a good chat. continue on for many more years to come. Just how do I put into words what my heart feels each time I look at you. You bring so many wonderful emotions to light everyday we share together. You can bring an outburst of tears of joy, just by looking at me the way that you only can do. My wonderful spirited friend, my Pomeranian. I am blessed to have you and your unconditional love. I am happy to contribute a few words in tribute to your years of devotion given to building a successful and distinct strain of your own and I hope that one day I will meet you in person. As a relatively new comer into the world of Pomeranian, I can only stand back in admiration of all your have accomplished. I am not sure just how many Pomeranians of today contain Crouchent ancestry but would hazard a guess it would be somewhere in the high hundreds? You will have to enlighten us. I know that my much beloved Yogi, " Ch Cupidtown The Instigator" would not be here today if not for your Crouchent Midnite's contribution. Thank You, as I gained not only a spirited friend but a successful show dog who actually enjoys what he does in the show ring.